Mindfulness meditation is a practice that cultivates awareness of the present moment and clears the mind of other thoughts, often accomplished by non-judgmentally focusing attention on the physical sensations of breathing or other experience as it occurs. Top-level managers appear to be highly interested in mindfulness at the moment, as evidenced by recent sessions on meditation at the World Economic Forum in Davos, Switzerland, and a cover story about mindfulness in Time magazine. Chief executives of major companies such as Ford Motor, Salesforce.com and Tupperware have publicly touted the benefits of meditation. Organisations as varied as Google and the United States military have instituted internal mindfulness-based training programmes for their employees. At Insead – in Singapore and abroad – professors incorporate meditation into executive and MBA courses. Although there is a risk that some may write off mindfulness as pop psychology or a management fad, it is more than that. The practice dates back more than 2,000 years to the Pali canon of Theravada Buddhism, and Western clinical psychologists have used secular mindfulness meditation training to effectively combat anxiety and depression for several decades. There are many articles in academic journals, particularly in the fields of cognitive psychology and neuroscience, that document the benefits of meditation. Meditating regularly increases how much people habitually focus on the present moment relative to the past and future at times when they are not meditating, a tendency psychologists call trait mindfulness. Research has linked increased trait mindfulness to increased positive emotions and decreases in several forms of negative emotion, such as rumination, depression, anxiety and anger. Previous research has also found evidence of other benefits, linking greater trait mindfulness to decreased substance abuse, improved psychological functioning, increased self-control, decreased overconfident gambling, decreased distraction from the task at hand and improved test performance. Recent research has also found that even a single eight to 15-minute session of focused-breathing mindfulness meditation can cue a brief state of mindfulness, which leads to changes in emotions and behaviour immediately afterwards. For example, a state of mindfulness has been found to reduce short-term negative emotions, distraction from the task at hand and the impact of negative information on attitudes and persistence. 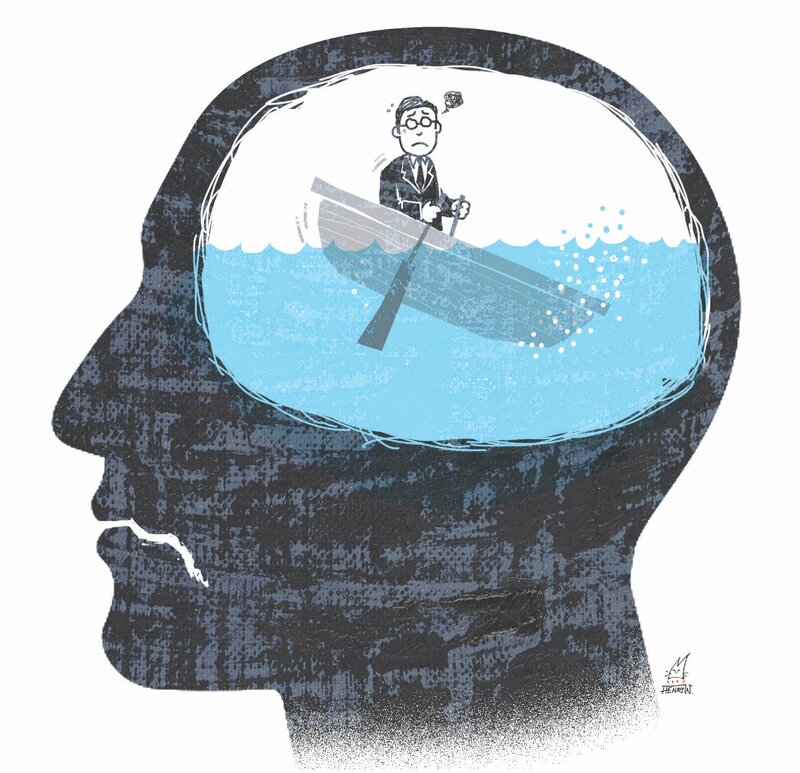 Illustration: Henry WongOur research team examined the idea that a short state of mindfulness could improve decision-making by helping people cut losses sooner. In other words, we were interested in whether mindfulness meditation could reduce what economists call the sunk-cost fallacy or the sunk-cost bias, which is the tendency to continue an endeavour after having already invested time, effort or money. We collaborated with Professor Sigal Barsade from the Wharton School at the University of Pennsylvania on a research article that appeared in the February issue of Psychological Science, a journal of the Association for Psychological Science. Our key finding is that mindfulness meditation increased resistance to the sunk-cost bias, and this occurred in a two-step process. First, meditation reduced how much people focused on the past and future, and this psychological shift led to less negative emotion. The reduced negative emotion then facilitated their ability to let go of sunk costs. Our findings can help managers and businesspeople, because there are so many cases in which the sunk-cost bias can destroy value. For example, people often hold on to losing investments for too long. Businesses often continue with projects even when the costs increase dramatically or their product is less unique or marketable than it initially appeared. Governments often continue fighting wars they know they cannot win. Managers can be reluctant to fire massively underperforming employees who they hired with great expectations. In all of these cases, resources are wasted that could have been used more productively in another endeavour, whether that is a more promising investment or project, peacekeeping efforts, or a new hire who is a better fit for the organisation. Our advice is that when people need to make decisions about whether to change course, that is a great moment to step back, clear one’s mind by meditating, and approach the decision again. There are also meditation classes and trainers in all major cities and excellent books on the subject by Thich Nhat Hanh and Jon Kabat-Zinn. More broadly, our findings suggest that even people with little experience meditating can use mindfulness meditation in small doses at times when they need it, such as when experiencing excessive negative emotions or stress, or when thinking too much about the past or future. For these reasons, mindfulness should be more than a passing fad, and instead a tool people keep at their disposal for use when it can be helpful. People and corporations should seriously consider the role mindfulness meditation can play in mental and emotional well-being, task performance and decision-making. Andrew Hafenbrack is a doctoral candidate in organisational behaviour and Zoe Kinias an assistant professor of organisational behaviour at Insead. Meditation may influence the way the brain processes emotions — even when you’re not actually practicing it, a new study in the journal Frontiers in Human Neuroscience suggests. Researchers from Massachusetts General Hospital, the University of Arizona, Boston University, the Santa Barbara Institute for Consciousness Studies and Emory University found that meditation changes the way the amygdala brain region responds to emotional stimuli — but that this effect on emotional processing takes place even when a person is not in a state of meditation. The amygdala is a brain region involved in emotion and memory processing. “This is the first time that meditation training has been shown to affect emotional processing in the brain outside of a meditative state,” study researcher Gaëlle Desbordes, of Massachusetts General Hospital and Boston University’s Center for Computation Neuroscience and Neural Technology, said in a statement. Researchers had study participants undergo one of three eight-week courses: one course was on mindful attention meditation, where they were trained to be more attentive and aware of their thinking, feeling and breathing; one course was on compassion meditation, where they were trained to feel compassion and kindness to other people and themselves; and one course just provided general health information. Then, 12 people from each group underwent fMRI brain scans as they looked at 216 images that were meant to provoke positive, neutral or negative emotions. There was no mention or instruction of meditation while the study participants were undergoing the brain scans, and they were followed up with after to make sure they were not meditating while undergoing the fMRI scans. The researchers found that the people who took either of the meditation courses experienced decreased activity in the amygdala in response to images that provoked negative emotions — a sign that they were coping well with stress and were experiencing stability of their emotions. But people who only went through the health education class experienced an increase in the amygdala in response to images that provoked negative emotions. Previously, Massachusetts General Hospital researchers found that eight weeks of meditation training was linked with more density of grey matter in the hippocampus brain region (which plays a role in memory and learning), as well as parts of the brain linked with compassion and self-awareness. That research was published last year in the journal Psychiatry Research: Neuroimaging. via Meditation Influences Emotional Processing Even When You’re Not Meditating: Study. Unwind your Mind and Get Creative! Click to sign up for Newletter! art Art and the Human Conscience Art for Kids consent based facilitation Creativity Good News Meditation Meditation and Addiction Meditation and Medicine Meditation Classes Meditation in Athletics Meditation in Business Meditation in Education Meditation in the Military Meditation Research Meditation Resources Meditation Techniques Meditation Tips Origami Outdoor Play for Kids Parenting Poems QiGong Sacred Shadow Self Seattle Events Spirituality Unwind your Mind Unwind your Mind and Get Creative! Categories Select Category art Art and the Human Conscience Art for Kids consent based facilitation Creativity Good News Meditation Meditation and Addiction Meditation and Medicine Meditation Classes Meditation in Athletics Meditation in Business Meditation in Education Meditation in the Military Meditation Research Meditation Resources Meditation Techniques Meditation Tips Origami Outdoor Play for Kids Parenting Poems QiGong Sacred Shadow Self Seattle Events Spirituality Unwind your Mind Unwind your Mind and Get Creative!